at KU Mammalogy include extensive historical collections from Central America, Mexico, and southeast, central, western regions of the United States and Alaska. Recently added holdings include specimens from the Philippines, New Guinea, and important material from Big Bend National Park, Texas. The program continues to excel at emphasizing its taxonomic strengths in bats, rodents, and insectivores. Most of our collection consists of prepared skins, skulls, and complete skeletons; with most recent specimens (1989 and later) accompanied by tissues. Mammals of Kansas is a site that includes a wealth of information on the natural history, distribution, and systematics of the native mammals of Kansas, includes numerous original black & white and color photographs, a dichotomous key to all species and a chapter on the physiography of Kansas. 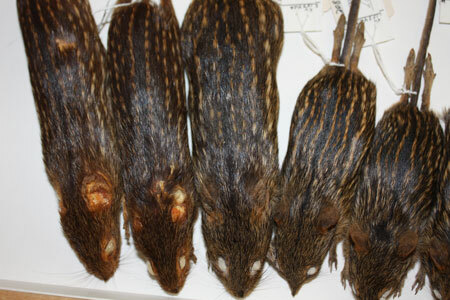 The mammal collection is one of the world's largest (the fifth largest mammal collection in North America and the second largest university collection in the world). The most common preparation type is a well-prepared skin, with the skull cleaned and stored separately. Second-most common is a skin with the entire skeleton cleaned and stored separately. Some specimens consist only of a skull or cranium. Other specimens may consist of a partial skeleton, an entire skeleton or only a skin. Some specimens are stored in alcohol, or are in alcohol with the skull removed and cleaned. Tissues associated with any of these preparation types are noted as a separate field in our database. Because there are active public education and exhibits programs in the KU Natural History Museum, a few of specimens are taxidermy mounts and some are housed permanently on exhibit. There are 135 type specimens in the collection. Of these, the largest number (97) are rodents. There are also 6 insectivore, 25 bat, 5 lagomorph, and 2 carnivore holotypes. Types have been described from Barbados, Canada, Chile, Costa Rica, Cuba, Guatemala, Honduras, Mexico (14 states), Mozambique, Nicaragua, Philippines, Venezuela, Martinique, St. Lucia, St. Vincent, and from 12 states in the U.S. There is broad taxonomic coverage, including important holdings of Central and South American marsupials, insectivores, bats, and rodents; Holarctic shrews, microtines, and squirrels; and North American bats, insectivores, carnivores, rodents, and lagomorphs.